Olympians Richard Murray and Flora Duffy captured the 14th annual Fedhealth XTERRA South Africa Championship on a magnificent Saturday morning at the Grabouw Country Club, which sits on the edge of the Hottentots Holland Nature Reserve in the Elgin Valley about an hour’s drive from Cape Town. 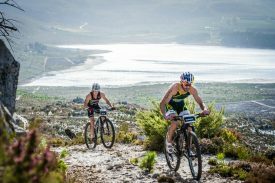 February 25, 2017 – Olympians Richard Murray and Flora Duffy captured the 14th annual Fedhealth XTERRA South Africa Championship on a magnificent Saturday morning at the Grabouw Country Club, which sits on the edge of the Hottentots Holland Nature Reserve in the Elgin Valley about an hour’s drive from Cape Town. It’s the second XTERRA SA title for Murray, who won his first in 2013, and the fourth straight for Duffy, who has won 11 consecutive XTERRA majors and 15-of-18 since her off-road debut in 2013. In the men’s race Murray, who placed 4th at the Rio Olympics last summer, needed every bit of his world-class endurance and speed to hold off the reigning SA Champ Bradley Weiss. He completed the 1.5km swim, 26km mountain bike, and 12.5km trail run in a lightning fast time of 2:22:46, just 19-seconds ahead of Weiss. Weiss, who won all three races in the FedHealth XTERRA South Africa series last year and the first one he entered this season at Nelson Mandela Bay two weeks ago, was 20-seconds back of Murray out of the swim and in a good spot on the bike before bad luck slowed him down. It was indeed an impressive day for Weiss, who fractured his scaphoid bone during a training ride in December and just recently returned to full training. Stuart Marais, the 2015 SA Champ, finished third to make it a podium sweep for South African men. XTERRA Belgium great Kris Coddens finished fourth, followed by Theo Blignaut, James Cunnama, and Francois Carloni from France. “XTERRA is an amazing event. It’s well organized and the athletes are treated really well,” said Murray, who has made no secret of his ambition to win the XTERRA World Championship in Maui this October. In the women’s race Duffy did what she does best … dominate. Her winning time of 2:39:00 was more than six-minutes faster than runner-up and SA Olympian Mari Rabie. Rabie, a two-time SA Champ (she won her first XTERRA title back in 2005), may be “retired” but is still one of the fastest female triathletes alive. Making her XTERRA debut on the day, Rachel Klamer from the Netherlands rounded off the podium in the women’s race. For further information on the Fedhealth XTERRA South Africa Championship email entries@stillwatersports.com or visit www.stillwatersports.com. Direct media inquiries to Jacky McClean, chief contributor to this report, via e-mail to Jacky@newsportmedia.tv. Female 19-24: Michelle KREBS, Paige BOTTEN; 25-29: Framke Boonzaaier, Zane COETZEE; 30-34: Johandri LEICESTER, Kate MUNNIK; 35-39: Sylvia VAN TROMP, Carol REEVES; 40-44: Aileen ANDERSON, Tessa KEERS; 45-49: Janet KEET, Birgit BOLLING; 50-54: Pauline LEITH, Lizl HOBSON; 55-59: Jacqui JACKSON. Male 19-24: Adriaan MYBURGH, Michael ROSS; 25-29: Janos DYLAN, Sebastian PAHL; 30-34: Matthew DANEEL, Gareth HARRINGTON, Jason REED; 35-39: Vernon VISSER, Marc PRICE, Trevor BAPTISTE; 40-44: Ralf FLETCHER, Shaun LUNT, Andrew ROWLES; 45-49: Phillipe VAN DER LEEUW, Gerrie BEUKES, Chris DE VILLIERS; 50-54: Douglas BURGER, Sean McCARTHY, Adam WHITTINGTON; 55-59: Frank SMUTS, Kevin DEWAR; 60-64: Dimmie DE MILANDER, Nic CLAASSEN; 65-69: Tim BRISCOE, Abel VAN DER MERWE.